We moved to the London Ontario area 4 years ago. Since then, we have helped dozens of dogs from London, St Thomas, Tillsonburg. Our clients come from Brantford, Barrie, and Sarnia. People travel because they see dogs that were out of control, become family pets and even enter dog sports and trials. Our clients go from fearful to playful. Others stop being destructive and making their owners frustrated and angry, to well mannered dogs – a pleasure to live with. Our program “POSITIVE TRANSFORMATION” is a unique alternative for dogs that do not respond to the basic training methods. We start by changing how the dog reacts to fear, and by building ‘stress coping’ skills. The more cognitive your dog is, the less emotional it can be. Can We Help Your Dog? You love your dog, but you don’t like your dog’s behavior. By addressing the cause, not just the symptoms (bad behavior) we can help most dogs make better decisions. Can we succeed where dog trainers fail? We often do. Not all dogs can be fixed with a group walk, or with ‘diversion’ tricks. We work with veterinarians and other canine medical professionals when needed to make sure your dog fits into your home. OUR GUARANTEE: If you complete the program we will provide ‘tune ups’, advice, and even free training if your dog slips back into old habits – for the life of your dog. How can we promise this? It is easy. We are highly trained and qualified as ‘behavior consultants’ and dog trainers. 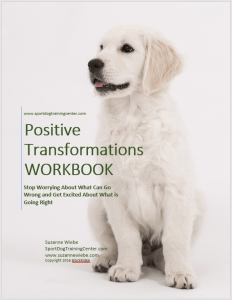 What is Positive Transformation Behavior Program? We created the Positive Transformation program to help people whose dogs were not responding to 6 week ‘reactive rover’ classes, or group walks. And, whose behavior was putting other dogs, or people, at risk. We will never hand you off to an intern. You will always work with a behavior consultant. After all, that is what you are paying for, not someone who is just learning. We will never use cookie cutter methods. Each dog has different problems. Some of these were caused in the whelping box. Some problems are inherited. Some problems are caused by trauma and fear. Each dog needs someone who can properly assess and create a case study of your dog’s behavior. Then use the therapies/techniques that have been proven most successful. You have confidence knowing that we are not guessing or following a ‘how to’ manual. Our Trainers are trained at the university level and have extensive (decades) experience in canine behavior and medical fields. They continually upgrade their education and are not afraid to prove their skills through accreditation and certification. Consultation: If your dog is not progressing at home you may request an inhome consult. They let us see if there are situations or triggers that do not present themselves in a session. After the first session or two some clients opt to continue via monthly inhome consults. This works well if you can invest a minimum of 30 – 60 minutes a day working with your dog. Cost is $150 per session. These are normally 1 – 2 hours. Reactive Dog Class: Limited 6 dogs. Class is divided by barriers and each handler works on their own dog with 2 trainers/consultants in the building at all times. You must attend the Workshop to book a reactive dog class. Cost: $175.00 (dogs are often teathered to the wall and behind barriers so they cannot break away from their owners, and to make the class as stress free as possible for owners and handlers. All programs include unlimited emails and videos. The sessions do not necessarily run concurrently. Extra work or make up sessions are booked individually at $50 hour. Each session is $425.00 If you are doing Stage #2 at the same times as Stage #1 there is no cost for the classes. Note: We never force a student to take more sessions than they feel capable of handling. We never ask you to move to stage #2 unless you are confident that your dog can handle classes. Remember that our behavior center is the best equipped in the London area. We have plexiglass walls, barriers, curtains, etc. Safety of all dogs is our #1 concern. Stage #2 – This can start any time through the process. It involves joining classes – even if you are at a distance, or behind a wall. Note: All our classes/group walks/ etc are set up for maximum safety of you and your other dog. We have walls, protective gear, and curtains. We promise never to put you in a situation where you do not feel comfortable. There are no quick fixes. Few dogs are fixed in 8 weeks. It is important that you take this journeywith your dog. You will see some improvement within the first few weeks, but it will take months to see a lasting, reliable change. Do It Yourself: Most dogs need 8 – 12 months of work before you see a lasting change. Too many times people want to quit our program when the ‘annoying behavior’ stops, but we haven’t finished. There is so much more we can teach your dog to make the change permanent. There are no instant changes when the problem is fear or stress. Dog trainers can use fear or pain to stop the a dog’s symptoms (biting/lunging/barking), but these methods do not address the problem. Eventually, the dog will ‘implode’ and you will lose control – and it is rarely good. That is why we work with your dog’s natural instincts, pack behaviors, and hormones to change the way your dog reacts to fear and stress. Canine Behavior Modification is a lifestyle. If you stop doing the exercises after a year or two your dog may regress. It doesn’t mean you need to do 20 minutes of exercises a day, but you do need to stay aware of your dog’s anxiety, and keep your dog’s mind active. Safety First: Amateur/uneducated canine behavior consultants have a ‘my way is good enough’ attitude and/or think force can make dogs ‘get over it.’ Like children, force increases fear, stress increases anxiety. There is no research or medical evidence that proves this is an effective treatment A dog needs to learn coping skills. They need to learn to stay calm afraid. Then, and only then, do you put them infront of their triggers (fears) in a safe environment. If you are still reading then you are a good candidate for a behavior modification program. You have shown that you are committed to finding your solutions to your pet’s problems. Please click the link to take you to a page that will best explains the problems you are dealing with. Or contact us to arrange an intake consult by phone, or in person. I want to get back in the show/trial ring.